The world wide administrative data built into STEM is represented as a graph. It is also possible for users to create their own custom graphs using the new graph wizard. 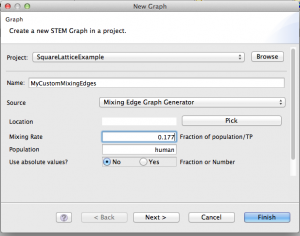 The New Graph wizard supports user creation of custom lattices based on a set of "Graph Generators." A graph generator is a pluggable component able to generate a graph (a collection of nodes and edges) either algorithmically or from an external file. Currently, we have implemented an abstract Lattice Graph Generator with a Square Lattice Implementation. 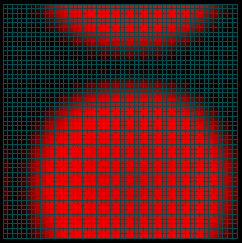 A user can specify the size of the lattice as well as several options for how the nearest neighbor (Common Border) are organized. In the future we plan to also support creating a New Graph From File. A graph generator can also be used to create a collection of edges (or other graph components) that can be optionally added to another graph. 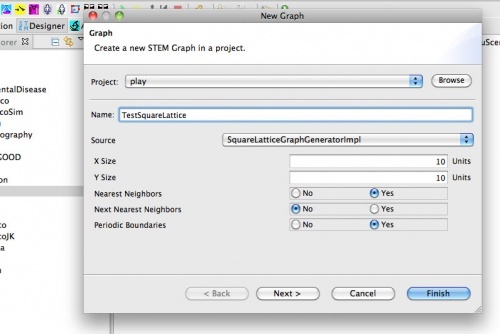 To use this feature, begin by launching the new graph wizard. The New Graph wizard also makes it possible to import files in a format similar to Pajek. For information on this format and how to import graph, please see the page on Importing a Pajek Graph. 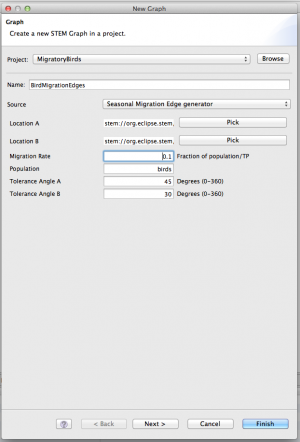 The Seasonal Migration Edge Graph Generator works together with a Seasonal Migratory Population Model to allow uses to create models where animals migrate seasonally between regions. The edges are just ordinary migration edges. My creating a sub-graph with only single migration edges from node A=>B (and no edge from B=>A), the Seasonal Migratory Population Model simply modulates the migration rate with a sinusoidal function. The Seasonal Migration Edge Graph Generator is a simple way to create a suitable collection of migration edges between two regions. Users are free to create their own sub-graph by other means including pajek. In the example below we show how a migratory sub-graph was constructed for an existing square lattice. See also Mixing Edges: When working with an existing graph, you can create another graph of components you may want to add to the original graph. For example, you can use the Mixing Edge Graph Generator to create a user customizable graph of mixing edges with a fixed (default) mixing rate or even individually specified mixing rates. Mixing rates can be specified as a fraction of the population or as a absolute number. If you add mixing edges to a model containing the original graph, mixing of a population will be enabled based on these rates (and the default model for mixing human populations will NOT be run). Mixing edges are created for a specified population and with a user specified mixing rate. Users can then edit the generate .graph file to tailor each and every rate based on their own algorithms or data. If you do not specify a location, a mixing edge is created for every physically adjacent region of every node within the graph. If you specify a location, mixing edges are created for every physically adjacent region the selected location (i.e., node) contains. For example, if you are working with a graph of the United States, specifying California will create mixing edges for every county in California. In the future, the graphical editor will also allow creation of specific edges.